Having produced the previous critically applauded album "Butterfly House" by THE CORAL, John Leckie has started work on a follow up album which is due for completion before the end of this year. In addition, John has also recently completed production of an EP by newcomers AHAB and is producing a new studio album for CAST. Meanwhile, Laurie Latham produced an album for Jools Holland entitled 'Rockinghorse' earlier this year in addition to the majority of tracks on his new best of album 'Finding The Keys'. Laurie has also produced new tracks for upcomers ' Super Luckies' on Tape Records. Ron Saint Germain has been working with 'Living Color' on their most noteworthy project - album 'The Chair In The Door' (Megaforce Records), adding additonal production and mixing. Chris Brown is mixing a debut album for 'Black Casino & The Ghost', a psychedelic alternative rock band with a Doors / Radiohead / Floyd-ish influence. (The project being A&R'd by legendary ex EMI executive Dave Ambrose). The Animal Farm have been producing tracks for 'Ideals' , whose debut will be released by Fierce Panda. 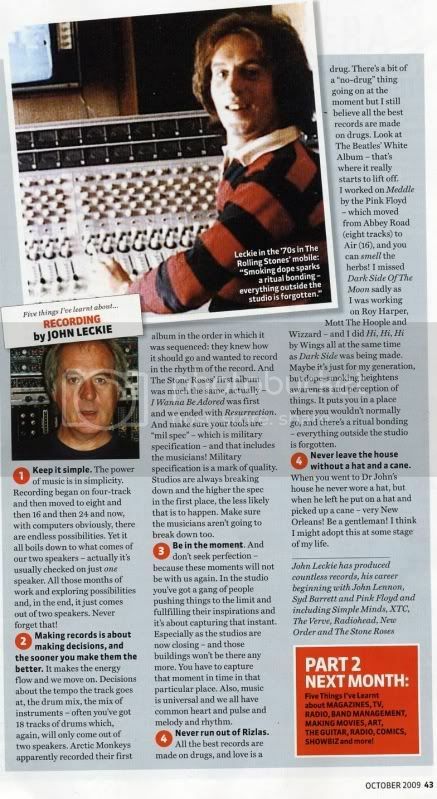 John Leckie is continuing to produce new tracks for 'The Coral' (Sony Music) into this new year and has also given an insightful interview for recordproduction.com. SJP's celebrated producer John Leckie is currently producing new album tracks for 'The Coral'. Happy with the results of the 2 tracks John produced before the new year, John has been welcomed back to produce more tracks for the bands next offering. The release date for the Portico Quartet's second album, entitled 'Isla' has been set for 19th October 2009 by their record label (Peter Gabriel's Real World Records). John Leckie produced this follow up to the bands Mercury Prize nominated debut, 'Knee Deep In The North Sea' between Real World Studios and Abbey Road earlier this year. The 20th Anniversary remasted version of the Stone Roses debut album, originally produced by John Leckie, entered the charts at number 5 this week. John, having recently completed a new album for 2008 Mercury Prize nominees "Portico Quartet", has spoken about his role as producer in various radio, magazine, newspaper and online blog interviews surrounding this release - including a spot on Steve Lamacq's BBC 6 music show "The Round Table" and selecting records while chatting with Janice Long on BBC Radio 2. (Links to some of these interviews and radio spots can be found on the left hand side column). The Stone Roses' self-titled album will be released in a new deluxe format this summer to mark 20 years since the record first hit the shops. Original producer John Leckie is producing a remastered version of the album and details of the track listing and contents for both a collectors' box set and smaller editions are yet to be announced. Released in May 1989 when the "Madchester" music scene was at its height, The Stone Roses has been cited as among the greatest albums of all time. Tracks include I Wanna Be Adored, She Bangs The Drums, Made Of Stone and I Am The Resurrection. Sony Music will release the new versions in August 2009. Welcome to the all new and improved website! We hope you find it as informative as our previous site but if we've missed something please feel free ask us any questions.